Below is the summary of the Classroom management discussion forum completed for my PIDP 3250 assignment #3. This is part three of the series of postings for classroom management. I wanted to post the summary here for my own reference as it will most likely be needed in the near future. I really like the compilation of references at the end of this summary. The summary is very comprehensive as it represents the postings and thoughts that were provided by my many colleagues. I think working with colleagues from various areas of education and professional life added some interesting perspectives to the summary. This was a very participatory discussion which included our class instructor, a facilitator, and 10 actively participating classmates. I want to thank everyone who participated. Represents the number of different participants involved in the entire discussion forum. The thread about closing the discussion was not included in the table as this was not an active discussion thread. – Classroom management is defined as the process for ensuring that classrooms run smoothly, even in face of disruptive student behaviors. – The main concerns voiced by classmates were disruptions by students who speak on their cell phones. Other concerns were constant questioning of instructor, chatting during class, drifting to online surfing, irrelevant questions asked during class and more. Find a balance between being too rigid and too flexible in your rules and penalties. A quote from a classmate relates to reaching a “balance” between being too flexible and too rigid. Deal with disruption in a way that will not create an overall negative class vibe. Look for any general reason why disruptive behavior is occurring. This could be boredom, lack of engagement, lack of challenge…. Addressing this will prevent future disruptive behavior. Motivate your students to create a positive and participatory learning environment. Be fair to all students – ensure you are not favoring one group or person over another and vice versa. Focus on developing a positive, professional relationship with your students so that they will want to engage more in the course. facilitator need to familiar with their faculty/learning institution’s student expectations. – Techniques to Manage student disruption will be discussed below. Several techniques are considered by our forum. facilitator should use the technique that they feel most comfortable with in their classroom. Use a white-board to write down questions that are not currently relevant; tell students that you will write some questions on the board in order to save class time; when time allows, you will address the questions. Ask another student about their thoughts on the problem student’s comment. Walk over to the problem student(s) and stand by him/her/them; perhaps even gently lean by their desk. Seek an explanation for the disruption in order to see if there is anything you can assist with; example, student maybe bored. Be respectful at all times; do not lower yourself to the level of the student if they are trying to bait you. if students have to answer their phones, ask them to leave class; ask these students to sit in the back in order not to disrupt their fellow classmates by going in and out of the lecture. Make a general gently class comment reminding the class of your rule regarding cell phones, “hey guys, this is a reminder that I find cell phone use to be distracting for my lectures”. Privately ask students who break the rules as to why they are doing this? Establish if they are bored? Not being challenged or engaged in the class? With the increase in online course participation, our forum considered various online classroom management concerns and how to address them. Some management techniques are common for online as face-to-face classrooms. Encourage critical thinking based on facts and not emotions; remind students to try to push emotions out-of-the-way; ask students to support thoughts with some sort of literature support to help them support their thoughts. Although there are a lot of pointers in this document, the class generally agreed that we all have our own styles, beliefs and degrees of comfort with respect to how we approach classroom management. This document was created to bring various approaches to our awareness. It is up to the individual facilitator to choose the method that works for them in a given situation. Barkley, E. F. (2010). Student Engagement Techniques – A Handbook for College Faculty. San Francisco, CA: Jossey-Bass. Lemov, D. (2012). Teach like a champion field guide: A practical resource to make the 49 techniques your own. San Francisco: Wiley, John & Sons. For PIDP 3250, we were asked to moderate an online discussion forum. My first thought here was OMG! Really? I don’t know how to do this. What do I do and how do I do it? Where do I start and where do I find out what to do? Needless to say, I was very worried. The course coordinator, Doug was very good and gave me a few pointers. He also defined my role to be one of a ‘facilitator of discussion’ using the assigned topic. I referred to his email instruction a few times during the active forum. I started with doing research on my topic of classroom management. I read a few articles and reviewed this topic from my PIDP 3100 course materials. I felt that I understood the topic at a level where I could moderate a discussion. Next, I wrote down several discussion topics related to classroom management. I planned to start my discussion with one topic and as the topic was exhausted, move to another topic. Once the first topic was discussed, the direction of the forum changed in a way that my original topics did not seem applicable. I had to modify my topics for discussion accordingly. I posted my first topic asking peers to share their classroom management concerns. I did define the topic in order to start colleagues thinking along the same line. Much to my surprise, many different points of concern and discussion arose. It was hard not to just post an opinion and at times, I couldn’t resist. I had to keep in mind that my role is to get everyone thinking and talking. It was also a struggle at times as I felt that we had exhausted all points. When this happened, I worked on moving the discussion to a different classroom management topic. Overall, this was challenging and fun. If I had to do it again, I would do the same things but I feel I will be more effective as I know what to expect, how people respond to questions, what type of questions get people involved/thinking. At the end, we were asked to submit a forum summary. This was something new as well. I totalled all responses, formulated a statistical look at the references and responses. I also devised a list of future references that were offered by peers. The last part of the summary is a discussion of the main points for each topic. This was very difficult as I went through all research, articles, and points of view. It took a lot of time and was very challenging to organize. At the end of this exercise, I am very appreciative of the experience and hope to apply it in my own future teaching. I also learned how to communicate as a moderator and participant (in other forums) in an online forum which was something I had not done in the past. One of my brilliant classmates (Maria) in another class introduced me to Web 2.0 images linked to Bloom’s taxonomy. Well, I liked it so much that I choose to add a different one to my blog site for future reference. Ever sit in a small group an not feel like you are part of the group? Ever feel like you don’t belong and that you are not like the others in the group? If so, you probably didn’t feel good in such a setting. You probably wanted to leave this group in search of a group where you felt valued and included. In a way, our classroom is just such a group setting. It is comprised by several individualizes with a somewhat common current learning objective coming together from all walks of life to learn. As facilitators, it is our role to ensure that everyone feel included and that we establish a learning environment that encourages our students to take safe risks, make errors and learn accordingly. How do we do this? There are many resources such as this article for strategies to inclusive teaching. However, I think the most important part of implementing any strategy is to role model such behaviour in a genuine manner for your students. Be positive in your feedback and make the students feel good about themselves and their opinions. Help students realize that each person’s perspective is a gift that they are offering the group. PowerPoint rescued: I’m naming this as my starting point. Today, I tried a new approach and used PowerPoint for my lecture but placed several small 3-5 minute video clips where students could watch simulation of various psychomotor skills that they were expected to gain. With each video, we practiced application of the skill in class. Then showed new slides and next video and implementation of skills. It worked like a charm. I just received a great email from a student thanking me for this session. It was fun, engaging and interactive. Student problems could be sorted out by peers as well as instructors walking about the room. By the time we reached the clinical simulation lab, students had already been exposed to basic skills. So, my personal conclusion is PowerPoint is only a tool that can be used in a weak manner or in a unique and challenging manner. It’s up to you. On the negative side, I have to mention that this was a lot of work/planning/organization and more. However, with the nice feedback received, it was well worth it. I think my PIDP teachings is starting to change the way I teach. Thanks PIDP teachers. Spend 4 minutes paying attention to questions that matter. Students ask one question that is content related per month. Spend time to really listen to question so that you can really hear with not only your ear but your heart. Take your problem…..spend 4 minutes to write down your question about your problem…..check out your questions, are they related to your problem?????? They may or may not be. You can look at your questions to see if the problem you thought you had was really what you were trying to solve. Deep thoughts! Ask the right questions in the right situation! This can be a gift to you and the world around you. I like using such questions in my lectures to help my learners think beyond the lesson. “Would you want this to happen to you?” related to a negative result from a poor clinical decision choice. I think it helps strengthen the topic and helps learners think about the negative ramifications of the improper procedure/decision. I also use such questions to emphasize great results. “Now, who wouldn’t want to do such a great job!”. When used appropriately, this is a strong teaching tool. 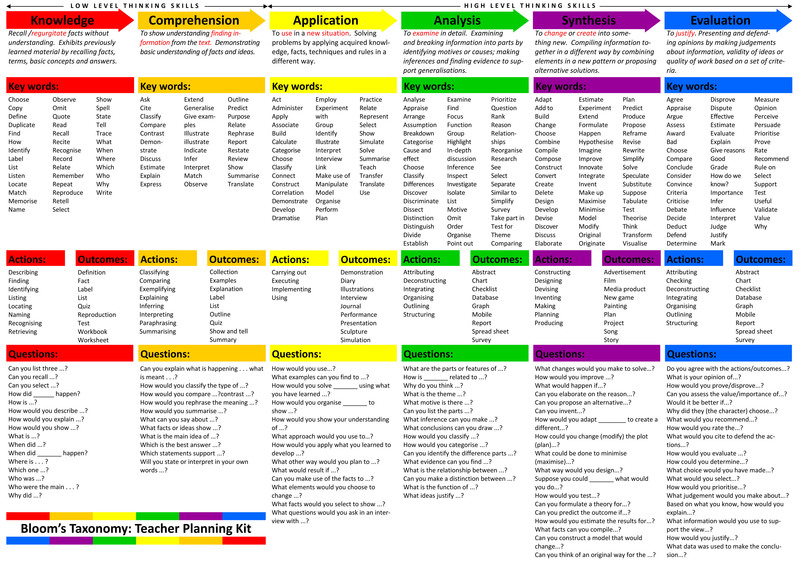 Bloom’s taxonomy is used as foundation to help facilitators identify and further develop their teaching in order to obtain higher level thinking skills. The link here is a great summary of the taxonomy, it’s uses and verbs that can be applied to our teaching. I wanted to include it in my blog for my future reference. It is comprehensive, includes outcomes and questions that can be asked at each level. Check out my GoAnimation presentation.